This is a link to a detailed 361 page instruction book on how to carve netsuke and miniature sculpture. The file is in Adobe Acrobat PDF format. The PDF file is called Carving_Netsuke It’s an 18 megabyte file, so sorry for the marathon download if you’re on a soda straw connection. Above is a reduced size example of a typical page. The page sizes in the actual document are common screen sized 7 1/2 by 9 inches. These instructions are copyrighted, and are intended for your non-commercial use. In other words, have a good time with them, but you aren’t allowed to make money from selling or distributing them (the instructions, not what you carve). I’m not charging you for them, so please don’t charge someone else. Thank You so very much for sharing your knowledge and skills !!!!! I think it is wonderfull you made this e-book. I am working in a specialised toolshop and are working to introduce this craft in Holland ( cos I like it myself too ) and this e-book is helping me to answer question in the shop. I know you have put a lot of energy and effort to make this book, it is very diverse, so thank you very very much. Thank you so much! What a generous offering. Thanks for the kind words, Roseanna. I hope you enjoy it and find it useful. Thanks for your sharing of your time and skill. Thanks, Mark. I appreciate the kind feedback! Thanks ever so much for sharing your Netsuke book so freely. I dropped on your website by sheer chance and boy am I glad I did. Fantastic Netsuke…and knives…and line drawings…and jewellery…and I could go on! Glad you are enjoying my blog, Colin! Hope you find it inspirational and useful. I have taken the liberty of posting a link on BritishBlades Tom. Quite a few people will be intereted in your work I’m sure. Had this book once before. Always wanted to find it again. Thank you. Glad you found it again. I hope it’s of help! Do you have any experience or words of wisdom for carving Tagua net? No, I’ve never bothered to carve tag nuts. I’ve always been suspicious of it and decided to not waste effort on it, but choose a more permanent material. Below is a link to more info on it from The Carving Path forum. Do you feel that tagua is less than permanent? I’m relatively new to tagua and was under the impression that it was a pretty durable material. I’m not a fan of tagua nuts. They start out life as a small coconut-like nut, with a liquid interior, then harden up as they age. Many people soak the in water to soften for carving, so I’m pretty certain they are a risk over time. Plus, there always seems to be a cracked center. I have one antique netsuke carved from tagua, and the material is less than inspiring, and would have been a better netsuke in another material. May I suggest you expend your artistic spirit on more permanent and rewarding materials like antler and boxwood? Best of luck in your carving adventures! You’re welcome! I hope it is of use to you, and good carving! I’m not having any luck downloading your How to Carve Netsuke book. Do you think the problem is on my end or…. When I click on your link I get a “File Not Found” notice. Please let me know if it’s working at your end. hey man, thank you for sharing. I just discovered your website advertising your free ebook. I would really like to own this book as a paper copy. 361 pages are too cumbersome to print. Is it possible to purchase your book and where. I do a little carving, mostly two-dimensional and have never been tempted to carve in the round. However I have always been fascinated by netsuke and would like to try my hand. Hope you can help. Thanks. Sue Lachenicht….all the way from New Zealand. Sorry, but I don’t have any hard copies available. Perhaps it might be possible to get it printed by one of those “on demand” printing companies online? I saw the netsuke collection of the Röhsska Museum in Gotemburg and since that time I loved them! Thank you so much to give us this wonderful book…! I’m glad you found me, and I hope the book proves useful to you. Thanks for the kind words! Found your link to this wonderful, wonderful book on the Carving Path forum. I can’t thank you enough for taking the time and effort required to write and e-publish it. We saw a beautiful collection of netsuke at the Toledo Art Museum in Ohio. Difficult to comprehend it all, especially considering they didn’t have electrically powered tools. Thank you for your kind words about my netsuke eBook. I hope it is useful to you, and good luck in your carving! I hope you find the book useful. Thank you so much for the kind words. I hope the eBook serves you well! Thanks! I hope you enjoy the eBook. I can’t download the ebook. Does the link work well? Thank you for sharing this great information. 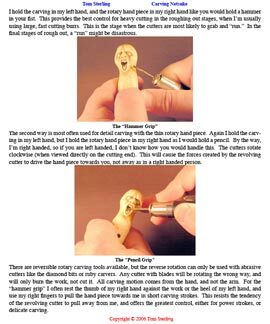 I’ve been looking for a new hobby and as I don’t have much room netsuke carving looks like it may be the answer. Hopefully I can adapt the techniques to carving stone .